If you are a book lover, when you visit Vienna you may want to track down recently published books or look for used or rare books for your collection. Or you may simply enjoy browsing in the city’s varied bookstores or exploring unconventional crannies to find book bargains. 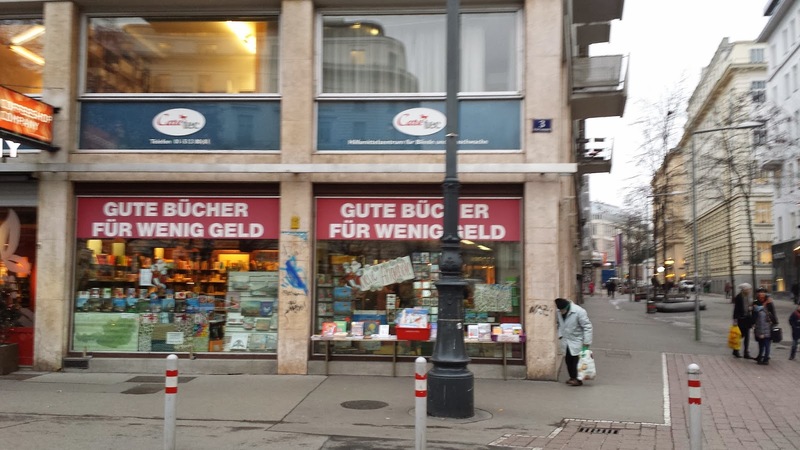 While the book buying, browsing, and searching experiences are probably more rewarding for people who read at least some German, even if you do not, you can still enjoy the ambiance of a comfy bookstore and the search for bargain books. Likely, you can find many books in English, especially at larger book stores. 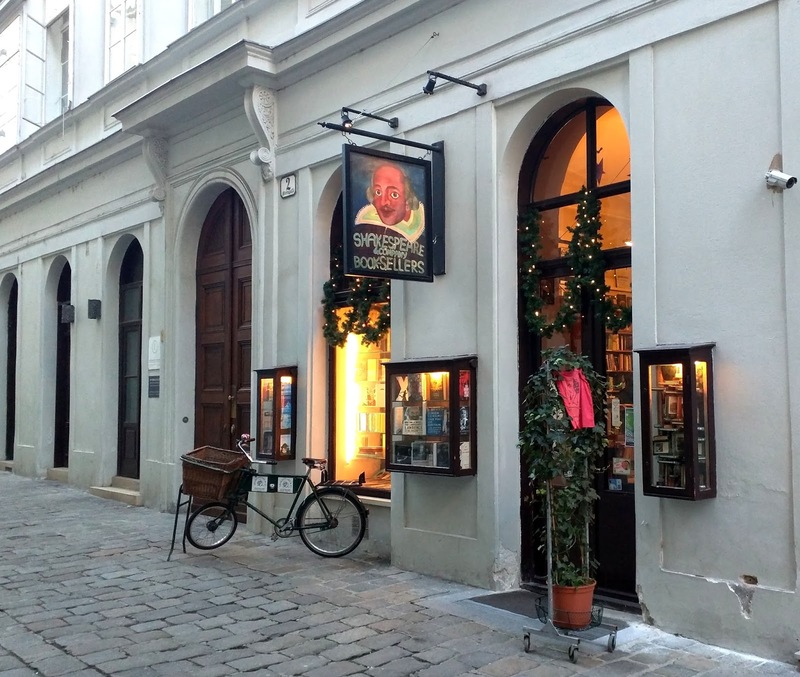 Checking out bookstores and searching for book bargains are major elements of my annual visits to Vienna, most recently in November 2015. Calling on that experience, plus my book­buying efforts during previous visits to the city, I suggest in this blog places you might visit in a quest for interesting new, used, and rare books. Of course, my suggestions are based on a limited search. 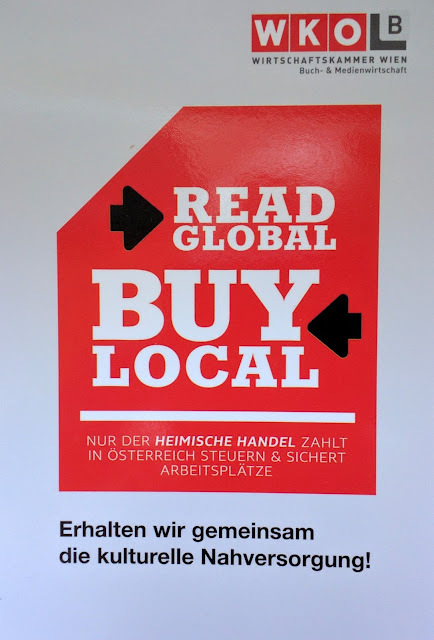 I have not set foot in many bookstores in Vienna, especially smaller, independent neighborhood bookstores scattered throughout the city’s districts (see the poster with photos of Vienna book sellers). Nevertheless, I can suggest where you might start your search for books. This guide is divided into three parts. In the first, I write about places to look for bargain used books. The second part identifies two areas of the city that have many bookstores within a few blocks of each other. The book stores in these areas sell full price and discounted books, used books, and rare books. The final part is a brief discussion of where to find stores selling higher end antiquarian books and related collectibles. If you enjoy scouting for book treasures or you buy books to resale, you probably are used to going to yard sales, thrift stores, flea markets, and other strange places to find valuable books at cheap prices. With the exception of yard sales, Vienna has the equivalent, but you must search them out. 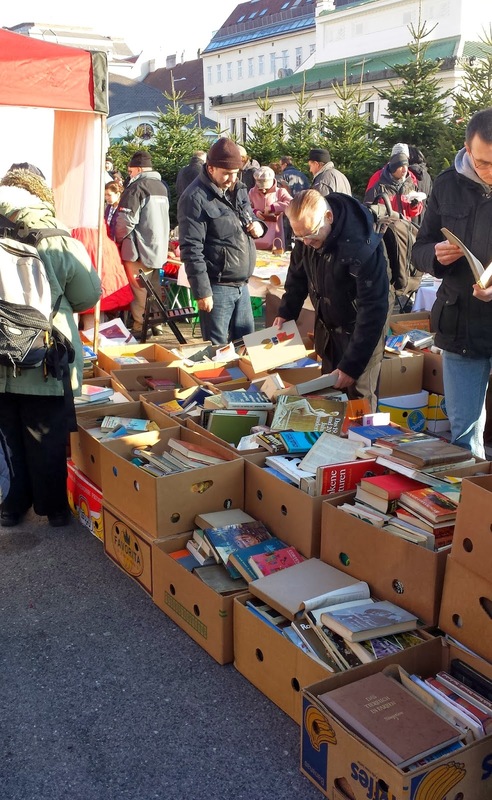 One place to locate some interesting and hard­to­find books (and other printed materials) at good prices is the Saturday flea market at Naschmarkt. I have had great luck finding items there related to my research interest in Austria between WWI and WWII. Most of the flea market sellers set up tables to display their wares. However, some simply spread their items on tarps they lay on the pavement. Many of the sellers with tables are regulars, and some of those regulars deal in books and paper collectibles. These vendors have nicely organized booths and (usually, but not always) moderate prices. The sellers displaying their wears on the ground are less organized and browsing their books is more inconvenient, but these books are more likely to have bargain prices. 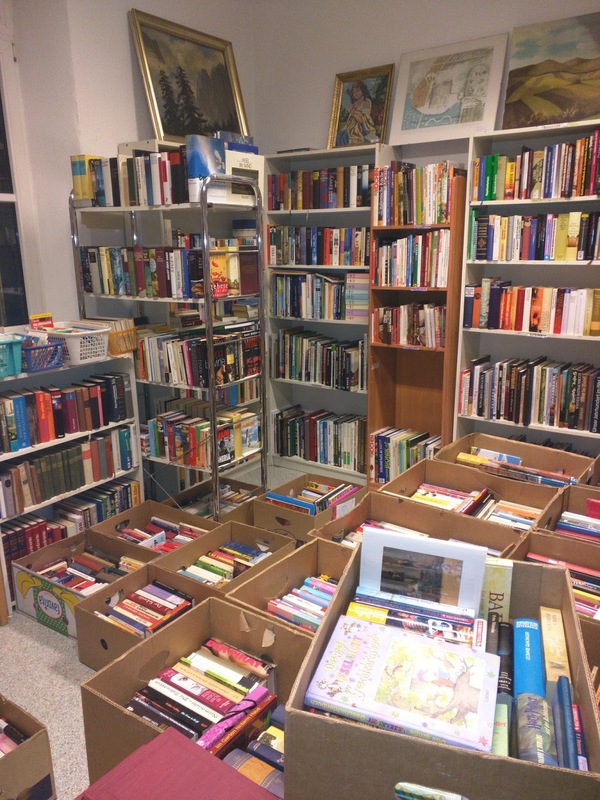 On a good day, you might find less­than­regular sellers trying to get rid of boxes of books for a Euro or two per book. Among my most valued buys at this flea market were messy boxes of photographs and letters, evidently from liquidated estates. At the market a couple of years ago, I bought an issue of a newspaper published in Vienna a few days after the Anschluss from a man who had a nicely arranged booth selling newspapers and magazines. I had a conversation with him about his wares, and he told me about his store located a few blocks away. A couple of weeks later, I was back at the flea market and saw a swarm of people going through piles of old books and magazines that a seller had dumped on the ground. The man from the newspaper booth was there, and I peered over his shoulder as he frantically searched for materials. I heard him scold the woman officiating at the booth for damaging some materials by the poor display. She asked him a question, which I did not hear. He replied, “Ich fresse Zeitschriften.” He was telling the woman that he devours old magazines. The guy was clearly a passionate collector. Unfortunately, I could not find him at the flea market a year later, and his store had closed. In addition to this weekly Saturday flea market at Naschmarkt, the city has regular and irregular flea markets in many other parts of the city. Sometimes you can accidently stumble upon them or on advertisements announcing them. For example, in September 2014, I had an apartment in the 15th district. Near my apartment I noticed an advertisement for an up­coming three­day flea market located nearby. Alternatively, you can systematically search for flea markets. 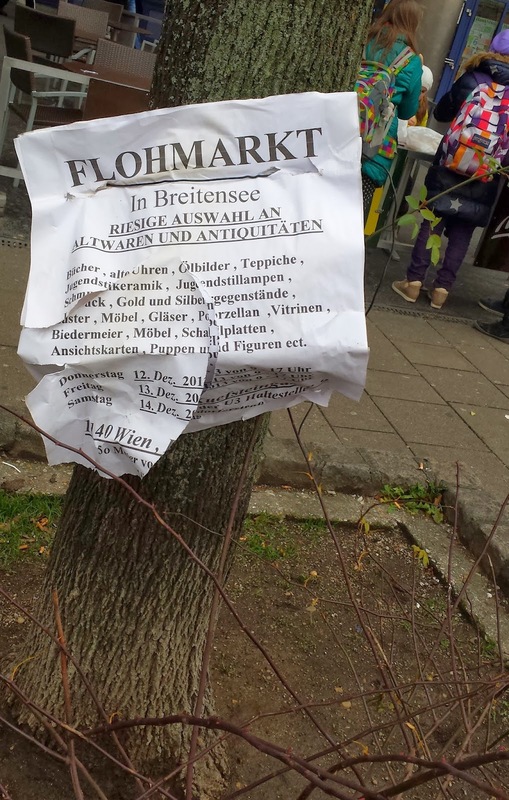 The best way to do that is to go to the following website that lists flea markets scheduled for the upcoming month: http://www.flohmarkt.at/termine/ . A recent visit to the site showed, for example, dozens on flea markets, including one devoted only to books, throughout the city during the month of August, 2016. Vienna has the equivalent of thrift and junk stores – those that sell used clothes, furniture, doo­dads, and other items founds in Goodwill and Salvation Army stores. My favorite is the “Second Hand Shop” (that’s its name) store across Berggasse from the Freud museum. To get there, find the big sign marking the museum, then walk across the street. The Berggasse store has a large room full of books selling for a few Euro each. I have bought several there over the past few years. Though these books were not as memorable as some that I have bought at the Naschmarkt flea market, they were good bargains. When I last visited this thrift store in November, 2015, I was surprised to find it stuffed with hundreds of older hard-cover books, most published over a century ago. Clearly someone had donated or sold a library to the store. No doubt the most valuable books from the library had long been scooped up by book arbitragers, but, still, many caught my eye. If the cost of getting them back to the U.S. were not so high, I would have gladly carried an armload from the store. Other “Second Hand” stores are scattered throughout the city, as are other thrift-­type stores. 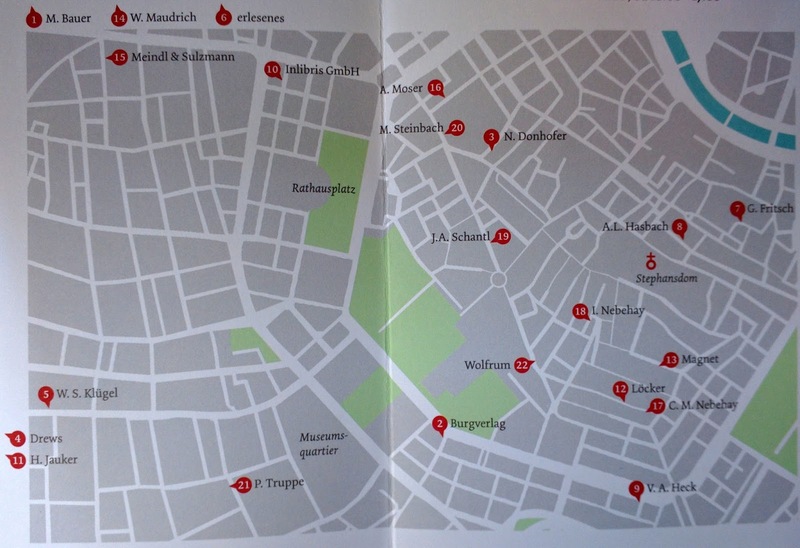 A partial list of these stores (not all selling books) can be found here: http://www.flohmarkt.at/branchenverzeichnis/wien . As you walk in districts outside the inner city, you are likely to pass stores that sell old and used goods – a cross between low­end antique stores and thrift stores. 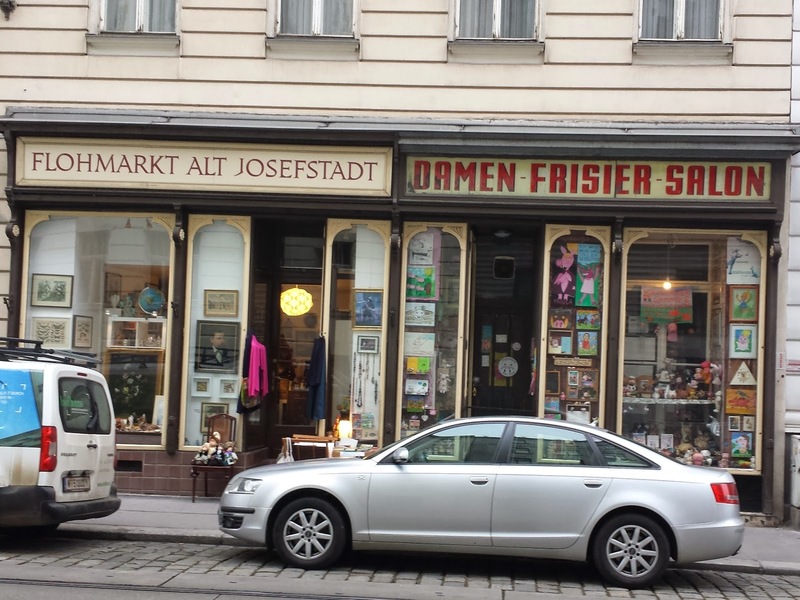 One example of such a store is named “Flohmarkt Alt Josefstadt” (which means Old Josfstadt flea market) at 52 Florianagasse (8th district). (For an update on this store, go to https://www.facebook.com/Flohmarkt-Wien-Josefstadt-140144719698971/ ) I have run across several similar stores in other neighborhoods. Some of these types of stores have books for sale at good prices. Sticking your head in for a quick look may result in finding a bargain book. I do not have much experience with these sorts of shops, but will visit more of them out the next time I am in Vienna. If you want to check out several bookstores in a few hours, I suggest that you try one of the two areas in which many books stores (selling new, bargain, used, and/or rare books) are located within a few blocks of each other. These two areas are (1) the Wollzeile – St. Stephens’s area and (2) the vicinity of University of Vienna. Before discussing the bookstores in these two areas, I should mention a distinctive characteristic of Austrian book stores: they charge nearly the same price for each new Austrian­-published book. The price of each new book is set by the publisher, and bookstores are not allowed, by law, to discount the price by more than 5 percent. 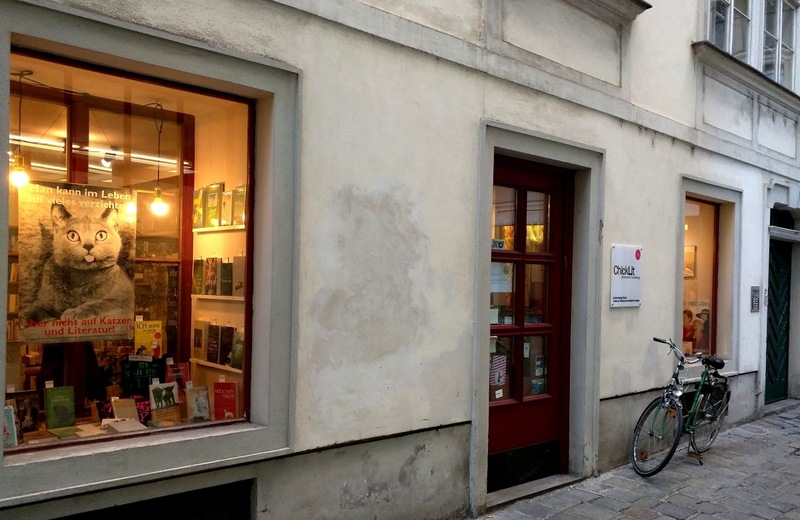 As a result of fixed prices for new books, new books in Austria are very expensive (the value-added tax also contributes to the high prices) and the country has many independent book stores, instead of multiple branches of a few chain stores. Although the fixed prices are hard on a book buyer’s pocketbook, they make it difficult for large bookstore chains to drive small, independent bookstores out of business by selling new books at deeply discounted prices. 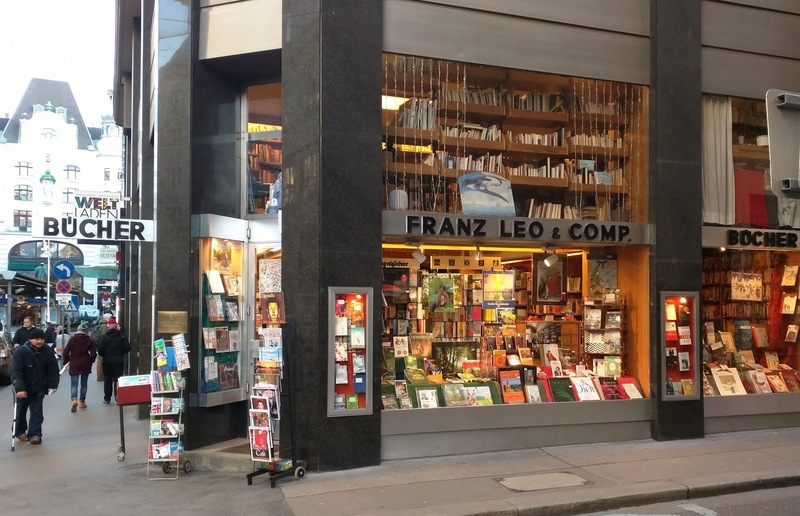 With no price competition for new books, larger stores compete with other bookstores primarily by offering a richer selection of books for sale in attractive surroundings. In turn, many smaller stores compete by stocking larger numbers of books in certain specialties (e.g., religion and theology books) or by serving a particular neighborhood or district. They also compete on the basis of the convenience of their locations and the personal service they offer. Eighteen months after the publication of a book, publishers can lower the price of new books that remain unsold. These books can be sold at the discount prices set by the publisher. These books are called Restbücher, and they are (or are equivalent to) “remainders,” in the United States. 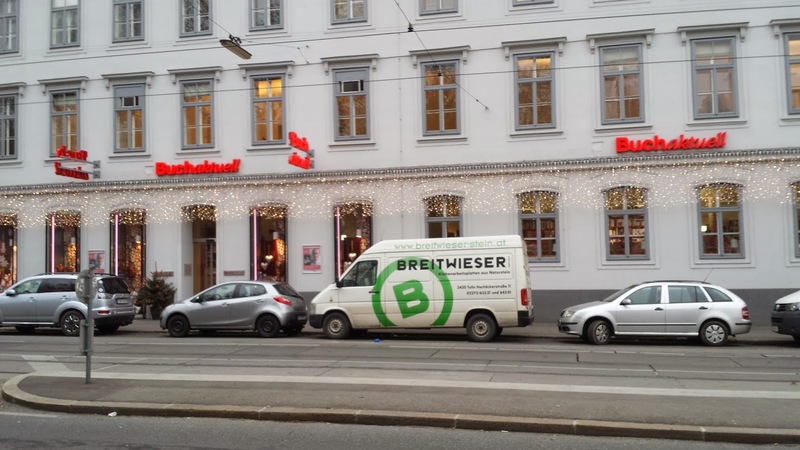 Vienna has a few stores that mostly sell restbücher. Also many regular book stores sell the most popular remainders along with their stock of full­-price books. The prices of new imported books and of used books are not regulated, and thus can vary from store to store. Some stores offer many of these types of books at bargain prices. 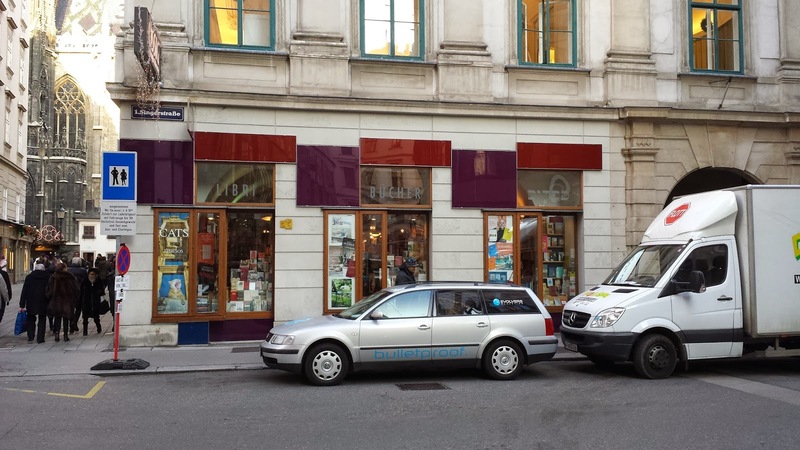 Because the sale of books is not dominated by mega­stores, Vienna has many small-­to­medium size bookstores. It also has several larger stores (2 or 3 floors of books). 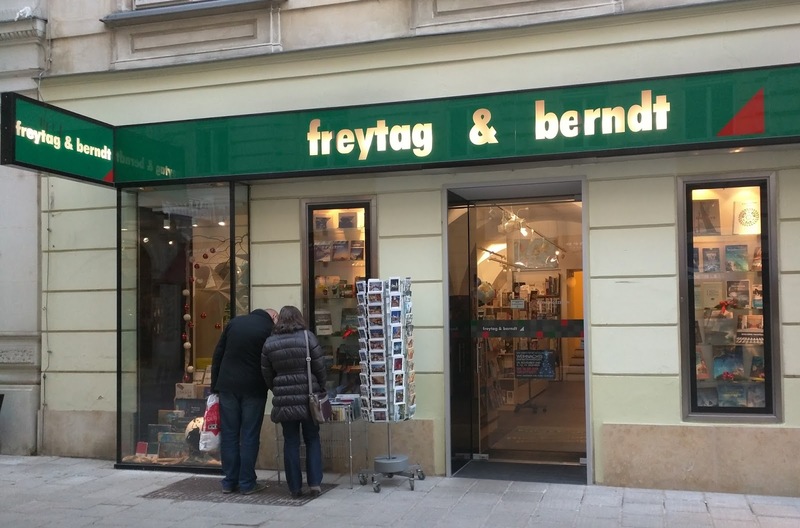 While many of the city’s bookstores are owned by independent book sellers, quite a few are part of small Austria­-based chains that have several stores in Vienna or other Austrian cities. Only a couple of book stores are branches of larger multi-­country chains. Size and design: Small store. Utilitarian design and layout. Types of books: The store features restbücher and imported books sold at a discount. It also has a small selection of new full price books. Type of store: This store appears to be an independent bookstore, but I cannot verify that at present. Update (December 2016): This bookstore used to be part of the small chain of Frick book stores. When I visited it in November, 2016, it was clear that the bookstore is no longer affiliated with Frick. However, the store seemed little changed from when it was. It is still features restbücher and imported books, plus a selection of new books. I am not sure what the name of the store is. Size and Design: Large book store (two large floors). Modern design, well lit. Types of books: Large selection of new books, plus CD and DVDs, audio books, maps, newspapers, calendars, and magazines. Some remainders. Type of store: Morawa is an Austria-­based chain with 19 stores in Austria. Of those 19 stores, 12 are in Styria, five in Graz, and one in Vienna. Types of books: Small number of popular new books are for sale, along with a variety of entertainment, education, and office products, such as CD/DVDs, games, toys, school supplies, and electronic devices. Type of store: Libro is a large Austria-­based chain with 74 stores in Vienna and a total of about 240 in Austria. Size and design: Medium size store. Solid, traditional design. Attractive window display of rare books. Historic look and feel. Types of books: Some new books among many used and rare books. It offers many used and rare books about Vienna and Austria. The store’s web site says it has 40,000 book for sale. 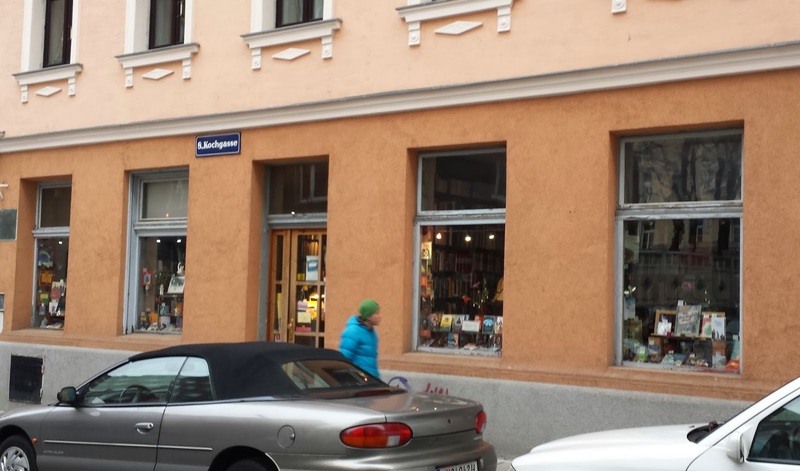 Type of store: Until 2015, two Hasbach bookstores were located on Wollzeile. The store at Wollzeile 9 closed on June 30, 2015, leaving this one. It is an independent bookstore whose beginning dates back to 1876. Website: See http://www.hasbach.com for a history of the store. This site has had a catalog of its rarer books for sale, but when accessed in August 2016 it listed only one book. Size and design: Three well-lit floors of books. Fresh, modern layout. Extensive inventory of books. It specializes in literature, nonfiction, theology, pedagogy and children’s books. Types of books: New books. Some remainders. 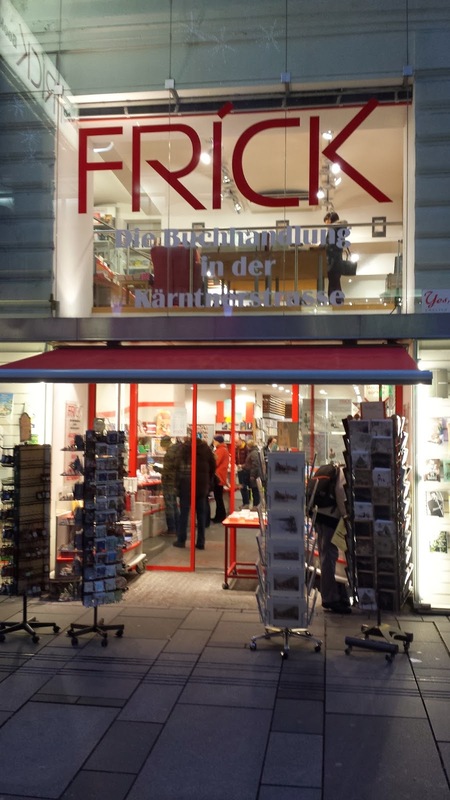 Type of store: This store is part of an international chain of bookstores with headquarters in Germany. Herder also is a book publisher. Bartholmew Herder founded a publishing house in 1801 and moved it in 1808 to Freiburg (where its headquarters are still located). 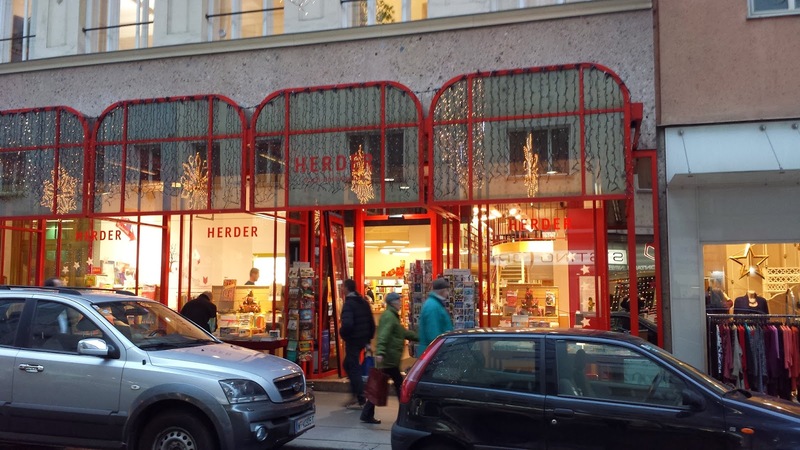 The Vienna bookstore dates back to 1868 when Herder’s grandson opened a store in the city. Before World War II, Herder had bookstores in many different locations throughout the world. 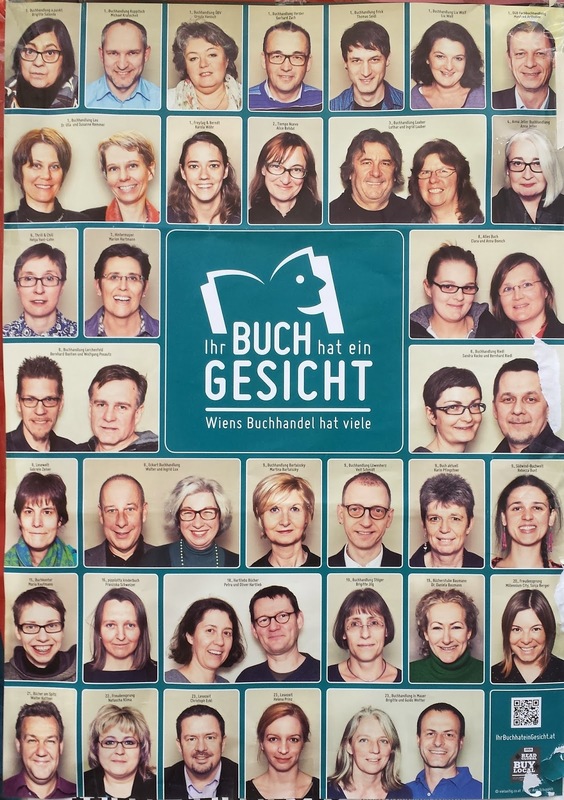 Now it has 25 bookstores in Germany (not all have the Herder name, most specialize in religion/theology books), three in Austria, and one in Italy. Size and design: When I first stopped by this small store about five years ago, it looked like an ad hoc temporary store, with concrete floors and most books displayed on tables. It had barely changed when I was last there in November, 2015, but apparently is a permanent outlet for the Frick chain. Types of books: The store sells remainders (Restbüche), damaged books, and imported books, mainly large format art books, at discounted prices. Type of store: This store is owned by the Frick chain. Size and design: This small bookstore has floor to ceiling shelves stuffed full of books. It is the only book store I have seen that is lit by a large chandelier. It is fun to explore. Types of books: Used and rare books, plus records (LP and single). Type of store: This store is the branch of a much larger store, Antiquariat Bücher Ernst, located at Gumperdorferstrasse 84. In addition to the bookstores on Wollzeile, several others are located by and around St. Stephens Church. Within a short walking distance of St. Stephens lie another dozen visit-worthy bookstores. Address: Schulerstrasse 1­3 (a block up Strobelgasse from the Morawa store on Wollzeile). This store located a few steps from the fiaker stand at the side of St. Stephens Church. Size and design: This is a large, two­-floor bookstore with a modern, but aging design. Types of books: This store sells new books, specializing in politics and philosophy. 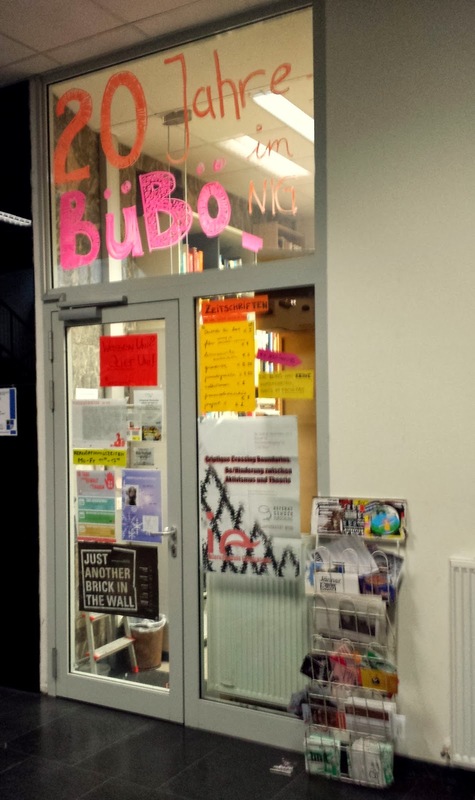 It has an assortment of left-wing magazines and books that are rarely found in other bookstores. Also, it has a large selection of books in English and other languages. 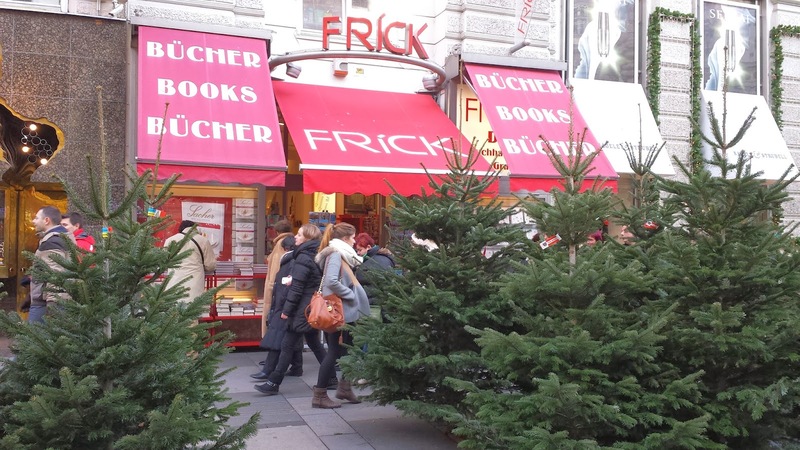 Type of store: This bookstore is one of the Austria-­based Frick chain. Size and design: Medium+ size store, modern design, and well lit. Types of books: Large selection of new books on religion and theology, plus children’s books. Also, good, but small social science collection. Size and design: Small book store with a modern and comfortable design. Types of books: New books, with a good selection of books about Austria, Vienna, and Tyrol. It also has a large array of calendars and books of interest to tourists (e.g., guide books and picture books). Type of store: This store is one of twenty Tyrolia stores in Austria, most in the western part of the country. Of those stores, 16 sell both books and various paper products. Size and design: Medium+ size. Modern, brightly lit. Comfortable for browsing. Types of books: New books with good selections in literature, art, theater, cuisine, and children’s book categories. Type of store: Leporello in an independent bookstore that has one branch in Vienna (located in the Burgtheater, Universitätring 2, across from the Rathaus). Size and design: Large store with four floors. Modern, but aging. Types of books: New books of all types. Large selection. Type of store: This store is one of the Frick stores. Frick has had a book store on Am Graben since 1875, and this Vienna­-based chain traces its Vienna ancestry to 1752. Size and design: Brightly­lit, very modern large store with three floors. It has inviting displays and entrance. Type of store: Part of the Vienna-­based Frick chain. Size and design: Large, classy bookstore. Nice layout and lighting. The entrance was designed in 1912 by the famous architect/designer Adolf Loos, whose famous “house without eyebrows” is nearby. Types of books: New books, with a large stock of university­level technical and specialized books related to law, taxation, and economics. Many of these books are published by Manz. Type of store. Manz not only sells books, but also is a publisher of many of the books it offers. The bookstore is not part of a chain. 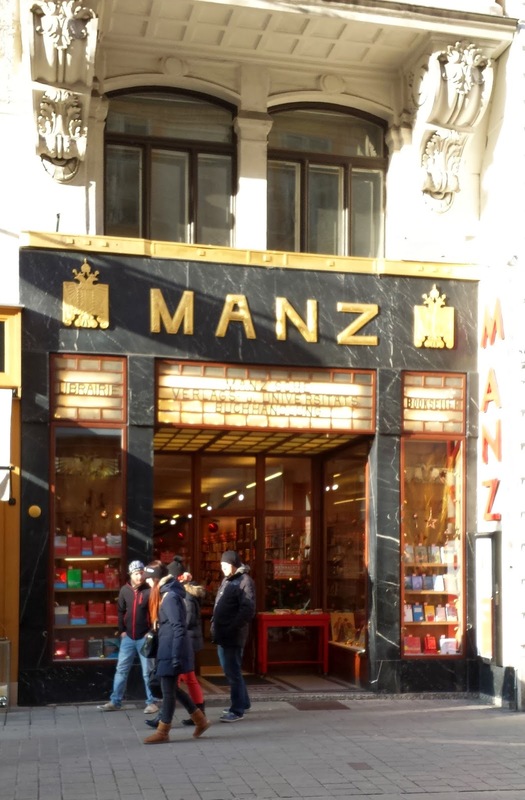 The Manz bookstore has been at this location for more than a century. The street is now full of upscale stores selling luxury goods. The bookstore is located very close to the famous Demel bakery. Address: Lichtensteg 1 (Rotenturmstrasse 13), near the famous clock at Höher Markt. Size and design: Modern, attractive two stories full of books. Types of books: Full service store, with wide variety of new fiction and non-fiction books. Type of store: Independent book store. Size and design: Large, sprawling store with used store vibe. Types of books: Lots of used and rare books, plus a selection of new books. It has a big selection of military and esoterica books. Its strengths include art, architecture, philosophy, psychology and literature, plus children’s books. Type of store: Independent store with lots of personality. Size and design: Classy medium-sized store with books in shelves that stretch from floor to very high ceilings. Types of books: English-language books of all types. This store has the best selection of, and the most, English-language books in Vienna. If you are looking books in English by popular authors or recently published best sellers, you are more likely to them them at this bookstore than any other in Vienna. Address: Fischerstiege 1 – 7 (This location is up the street from Shakespeare & Co, where Sterngasse meets up with Fischerstiege. It is at the bottom on steps that turn off of Salvatorgasse, a street that borders the nearby Maria am Gestade Church. Size and design: Nice looking medium-sized book store with tall bookcases. Types of books: Excellent selection of serious books for smart people. Type of store: Independent books store. Address: Kleeblattgasse 7 (This store is in an alley off of Tuchlauben. To get there, go the end of the Graben away from St. Stephens Church and turn right on to Tuchlauben. To the left, just past Steindlgasse (location of the famous Gösser Bierklinik) is a small alley. That is Kleeblattgasse. Walk up the alley to Chicklit. Size and design: Small store with a comfy layout. Types of books: See the name of the book store. Size and design: Small, upscale retail store for affluent shoppers. Types of books: Freytag & Berndt are publishers of all kinds of travel guides, maps, atlases, picture books, and other books for travelers. This store sells its products. The company has two other bookstores, both in Germany, one in Regensburg and the other in Nurnberg. Type of store: Owned by a publisher based in Germany. The second area for book shopping is a bit larger than the first. It includes stores near the main University of Vienna building, which is located on the Ring by the Schottentor, plus book stores on or by three major avenues within walking distance of (or short tram ride from) Schottentor. These three avenues are Alserstrasse, Spitalgasse, and Währingerstrasse. Size and design: The store is large and chaotic, stretching across two storefronts in a not­-very-­attractive way. One of the storefronts was previously another bookstore. The store has two floors. The front of the store has bins stuffed with items that might interest tourists, visitors, and casual strollers. Types of books: The books in the store windows and in bins located in front of the store are mostly travel, cook, and picture books. The store also displays and sells CDs, DVDs, calendars, and other souvenirs. Inside, the store has a good selection of new general fiction and serious nonfiction books. Type of Store: This store is apparently an independent bookstore with no other branches. It is a utilitarian store with a large footprint. Note: The store is located next to a Starbucks. Size and Design: Large book store with three floors of books. Modern design. Well lit, with good displays. Types of books: Full-­service store with a large selection of new books, both fiction and non­fiction. The main floor has many discounted books. The store also has a large selection of magazines. The store has an up-­to-­date inventory of history and political science books in its huge basement. I have purchased several books from this store, which I enjoy browsing. Type of store: The store is an independent store that dates back to 1826 when Matthaeus Kuppitsch started selling books at his own store. Kuppitsch has a second store at the Old General Hospital on Alserstrasse that sells, mainly, discounted remainders (see below). Size and design: Medium­size store with an attractive layout. Types of books: The store sells used and rare books, plus other paper items such as autographs, maps, and historic papers. It specializes in first editions, illustrated books, philosophy, psychoanalysis, natural sciences, history, and Austrica. Type of store: This is an independent books store. Its owner writes on its website that he has been selling books for 25 years. Website: The store’s website has a catalogue of books for sale with prices and descriptions. The site is www.antiquariat­moser.at . 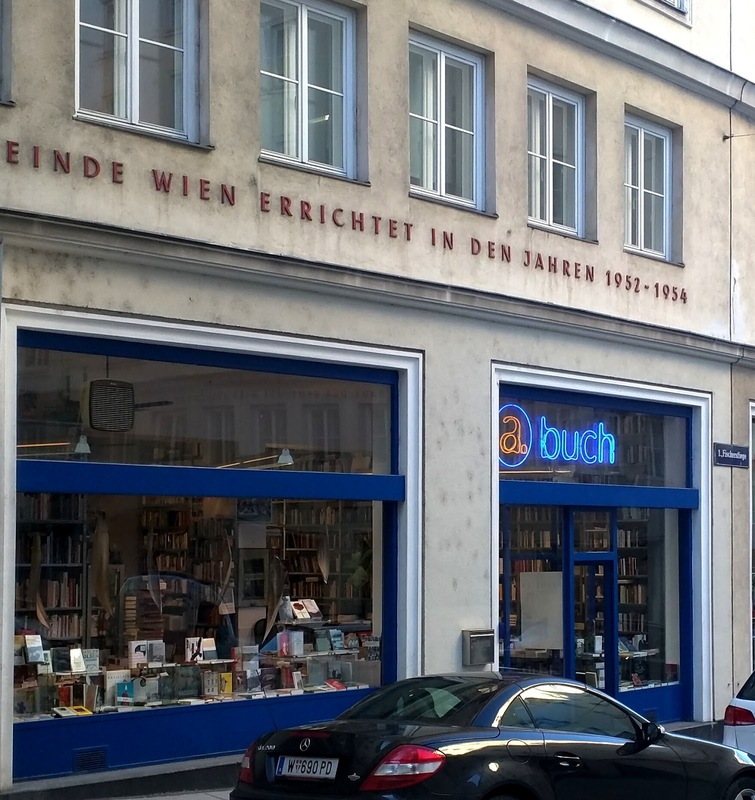 The next seven bookstores are on or near Universitätstrasse, which runs alongside the main University of Vienna building, and on Alserstrasse, which is an extension of Universitätstrasse. Of the seven, the first two book stores are located a couple of blocks up Universtätstrasse from the Ring in a building called the Neues Institut Gebäude. I know this building well because in the Fall semester of 1967, I took a course whose classes were in the building. That year, while attending the Institute of European Studies, and during the 1971­72 academic year, I visited this building most days to eat at the reasonably priced Student Mensa, an eating place for students, on the 5th floor of the building. Size and design: The bookstore is small with an efficient, functional design. It has a large area given over to photocopy machines. Types of books: The store sells new books, largely non­fiction related to culture and social sciences. Though the over­all number of books for sale is limited, it has an extensive collection of books (many of which are not available in other stores) related to its specialties. 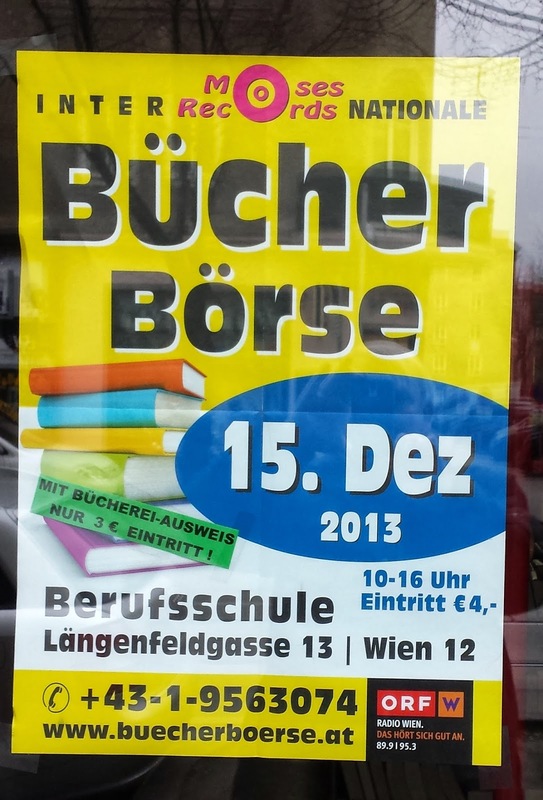 Also, of course, it sells textbooks for courses taught at Universität Wien. Size and design: The bookstore is in a smallish room with floor-­to-­ceiling bookshelves. Most of the space in the store is taken up by books, so it is crowded when only a few people are in it. Types of books: The store sells a nice selection of used books at modest prices. I have purchased several hard-­to-­find books there, mainly on Austrian history, for four to eleven Euro. It has both fiction and nonfiction books. Type of store: The bookstore is independent. Note: This store is on my must­-visit list whenever I am in Vienna. It always seems to have some treasures at reasonable prices. Also, the first floor of the NIG has publicly accessible restrooms, which are a welcome amenity when walking around in the area for an extended time. The next book store is across Rathausstrasse from the Neues Institute Gebaude. Size and design: This is a medium-sized store that appears to have been recently modernized. Most of the books are on the main floor, but its used and rare books are shelved in a loft area. Types of books: The store sells new, used, and rare books related to issues of interest to unions and union members. It can be described as a “leftist” book store, with books on current issues and social problems from a progressive, labor, or socialist perspective. Most of its books are new, but the store also has a good selection of used and rare books. The store also sells tee shirts, bags and other items with pictures, logos, and slogans that would appeal to the progressive crowd. Type of store: The store belongs to Österreiches Gewerkschafts Bund (Austrian Trade Union Federation), which has its own press. Many of the books in the store are from this press. As you continue to walk up Universtätstrasse from the Ring, you come to a busy multi-lane avenue (Landesgerichtsstrasse). After you cross it, you are on Alserstrasse. Up a block, on the right side of the street, is massive block-long two-story structure that used to be the city’s main hospital (Allgemeines Krankenhaus der Stadt Wien). It is now known as the old general hospital (Altes Krankenhaus, AKH). The building complex is used mainly for university offices and institutes. One entrance to the Old Hospital’s courtyard is at the corner of Östarrichipark. Up a block is an entrance at Spitalgasse. 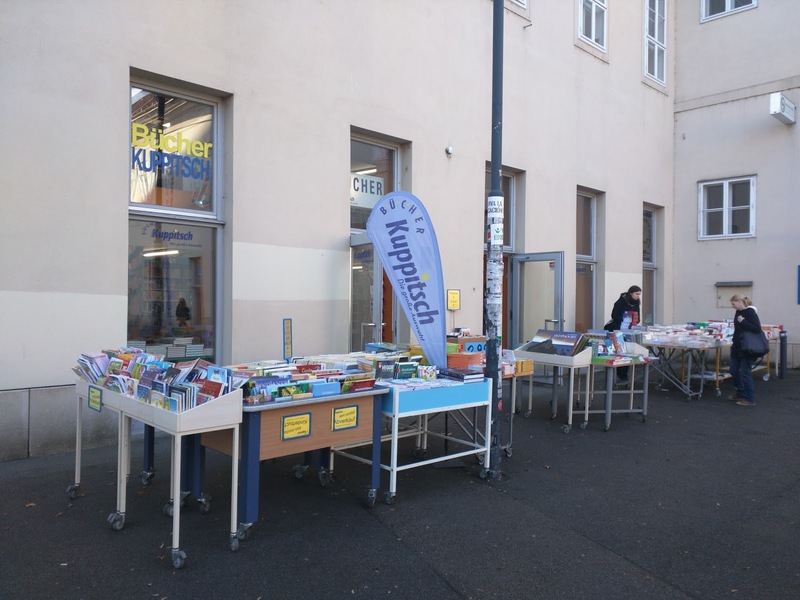 To access the bookstore in the Old Hospital, go to the entrance near to Spitalgasse entrance. Size and design: The store is small, a single floor, with an institutional feel. Many of the books are displayed on tables or stacked on the floor, though the store also has many display bookcases. Types of books: This bookstore sells many remainders. It also has a small selection of new books sold at full price. The store offers many copies of what seems like a small number of books. If you can find a book you want, you get a great bargain. This store also offers a substantial selection of children’s books, travel books, and English-language books. 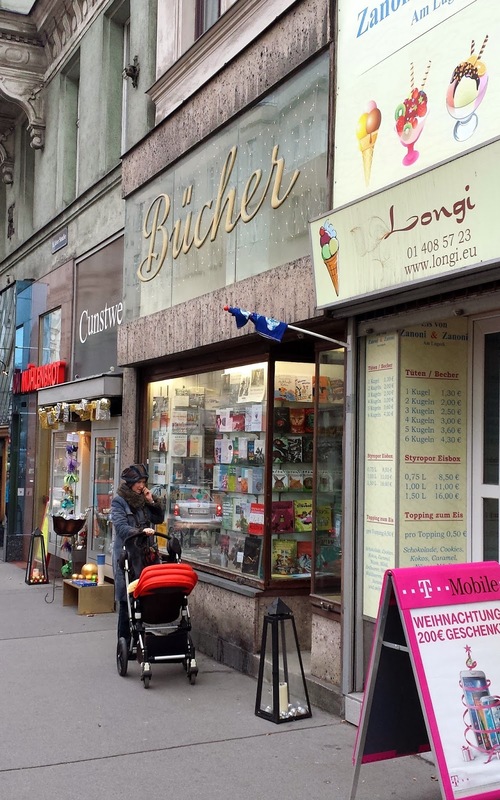 Type of store: This store is an outlet of the Kuppitsch store on Schottengasse (described above). Size and design: The store has a single floor and adapts space from the old hospital. It has an attractive window display. Types of books: As its name indicates, it sells books related to the study of languages and has a good selection in English and French, plus smaller amounts of books in other languages. 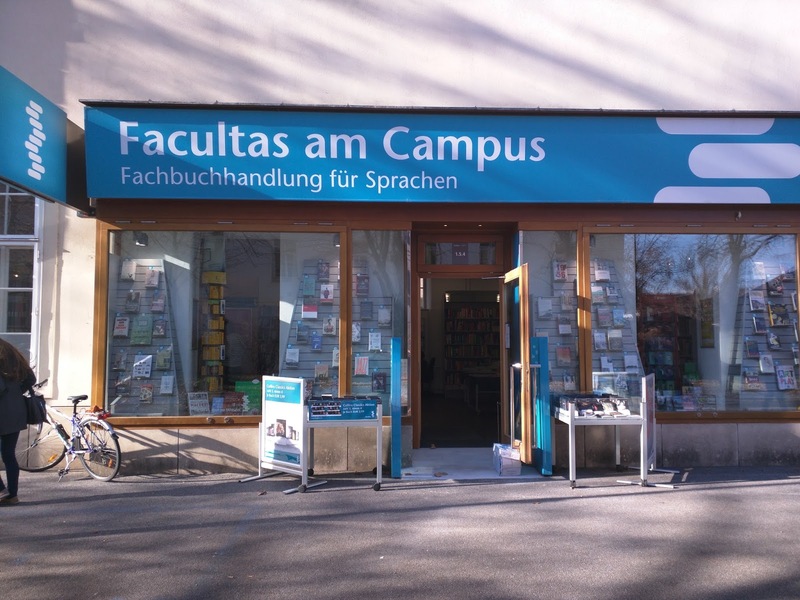 Types of store: The store is a branch of the growing Facultas store that has specialty locations in and near universities in Vienna. Exiting from the AGH grounds, you are back on Alserstrasse at its intersection with Spitalgasse. 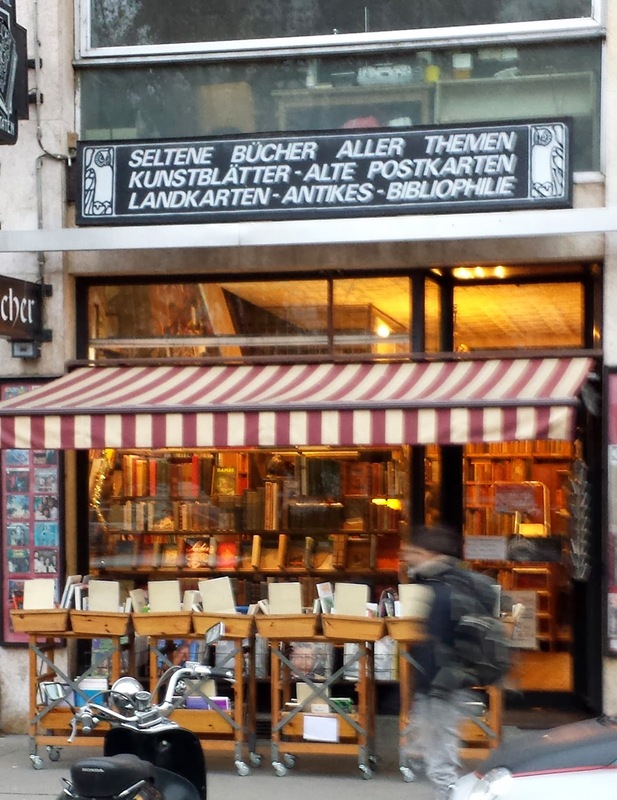 Up a block or so and across Alserstrasse, there is a side street, Kochgasse, with two bookstores. Size and design: This is a small store with a solid bookstore feel. Books are displayed in an orderly manner on floor to (low) ceiling bookshelves. Types of books: The store sells used and rare books. It has a large selection of books related to Vienna and Austrian history. Its specialties include literature, arts books, natural science, travel and Austrica. Also it sells old maps and graphics. Website: www.antiquariat­ms.at . This site usually has a catalog of books to be sold at an Antiquarian Book show. Note: I usually visit this store every time I am in Vienna. I have purchased some maps there, plus some modestly price used book related to the 1920s in Vienna. The service at the store is friendly. Size and design: Moderate-sized store, though larger than Antiquariat Meindle & Salzmann. Types of books: This store sells a wide assortment of used books and other used items such as photos and movie ephemera. Type of store: This store is not part of a chain. 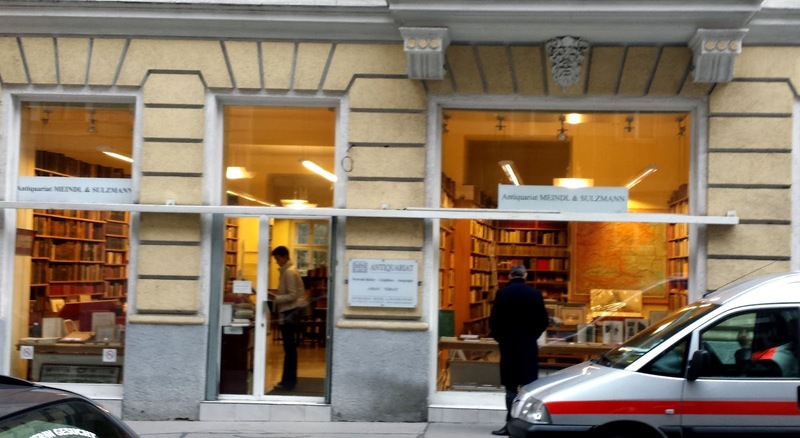 Back on Alserstrasse, one pleasant neighborhood bookstore is located a little further up the street from Kochgasse. Size and design: Medium size store with a nice selection of books and a traditional design. The owner clearly takes pride in the store. Types of book: New books of general interest. Type of store: Independent store that has been operating for about 15 years. The final book stores are on a route from Alserstrasee down Spitalgasse to Währingerstrasse, then down Währingerstrasse back to Schottentor. Size and design: This is a moderate sized bookstore with a modern design. Types of books: New and antiquarian books related to medicine, pharmacy, and health occupations. Included in its inventory are text books and readers for students of medicine and other health sciences. Type of store: This store is part of the Vienna-­based Facultas chain. Size and design: This is a medium+ sized, modern bookstore. It has nice design and good lighting. Types of books: The store sells new books of general interest. 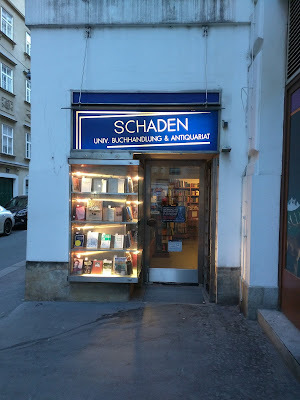 Also, it has a wide selection of books related to pharmacy, medical, and health, many published by the Austrian Pharmacy Publishing Company, which owns this bookstore. Type of store: Owned and operated by the Österreichiesche Apothekter Verlagsgesellschaft (The Austrian Pharmacy Publishing Company). Size and design: This is a medium-sized bookstore with relaxing music and a calm atmosphere. It is a nice place to browse. Also, the store has a large room in its cellar at which presentations are frequently made by visiting authors. Types of books: The store has a good selection of recent fiction and non-fiction for general readers. It is an attractive shop serving the neighborhood or surrounding district. Type of store: This store appears to be an independent bookstore. After visiting Orlando, return up the Berggasse hill to Währingerstrasse. From there, it is a short walk back to Schottentor and the main University of Vienna building. 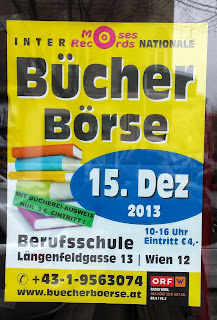 Under Austrian law, and probably to the relief of the store owners and employees, these bookstores are closed on Sunday. 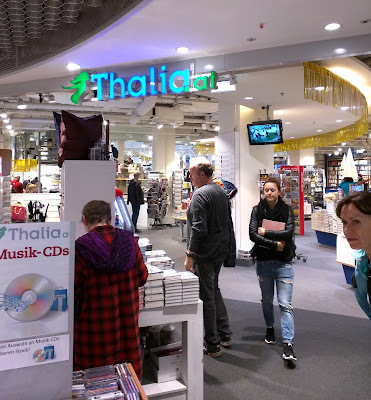 Fortunately for eager book buyers, the Thalia chain operates large book stores – open on Sunday – at the three largest train stations in Vienna: The Wien Mitte -- City Center -- station at Landstrasser Hauptstrasse 2a/2b, the West Train Station (Europaplatz 1), and the new Hauptbahnhof. The City Center store opens on Sunday at 11:00 a.m. and closes at 9:00 p.m. The City Center bookstore opens on Sunday at 11:00 a.m. and closes at 9:00 p.m. The book store at the West Train Station opens on Sunday at 9:00 a.m. and closes as 9:00 p.m. At the Main Station, which is slowly expanding its operations, the book store opens at 11 a.m. and closes at 7:00 p.m. on Sunday. Thalia (http://www.thalia.at/shop/home/show/ ) is the largest book chain in Germany, and it has 35 book stores in Austria, including seven in Vienna. Resembling in many ways the Barnes and Noble stores in the United States, they offer sprawling stores with attractive displays for prolonged browsing and the opportunity to buy the latest and best new books on the market. Another avenue for a Sunday book fix goes through the city’s many museums. The bigger museums are open on Sunday, and they have their own small book shops or gift shops with books. 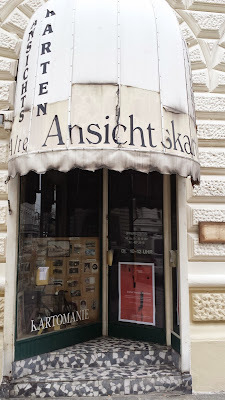 For me, two of the better museum bookshops are at the Wien Museum (locate by Karlskirche at Karlsplatz 8) and the Jewish Museum in the 1st District (see http://www.wienmuseum.at/en.html and http://www.jmw.at/en). When in Vienna, I usually make multiple visits to the Wien Museum, sometime just to check out the books. Both of these museum book shops have a small, but very intelligent selection of books related to their exhibits. Other places with books available on Sunday are the various major art museums (Albertina, Belevedere, Kunsthistorisches, Secession, Leopold, etc.). Usually the books are mingled among the souvenirs they offer for sale. At many of the museums (for example, the Albertina and Secession), a visitor can go to the gift store/book shop without buying a ticket to visit the museum. Clearly, a book lover does not need to give up the search for books on Sunday. A pleasant Sunday afternoon can be spent perusing the books at a Thalia bookstore and at the book/gift shops of the city’s great museums. 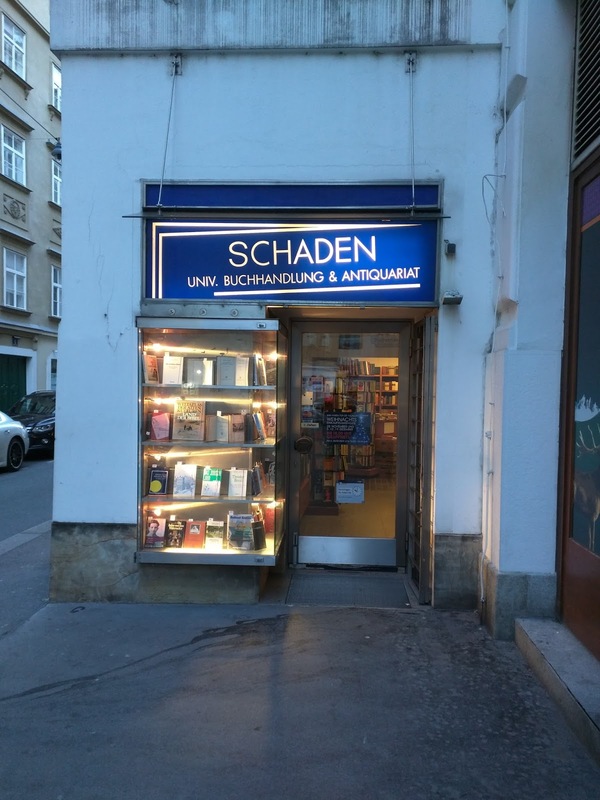 For folks with an interest in locating rare or more expensive used books, Vienna has many stores selling them. 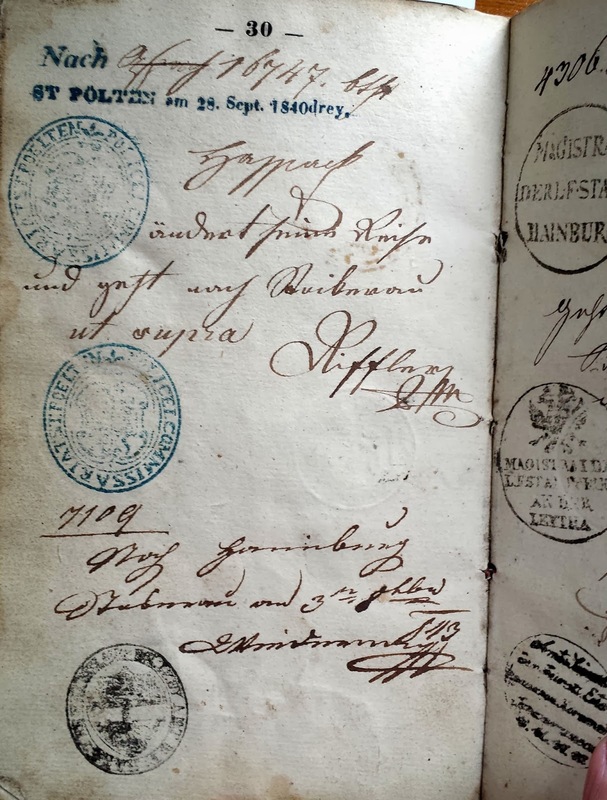 I have already mentioned two Antiquariat (the German word for stores selling used and rare books) in the Weinzeile/St. Stephens area. Many others are scattered throughout the city. Before discussing the location those stores, I will mention three places to explore in search of older books and paper materials. 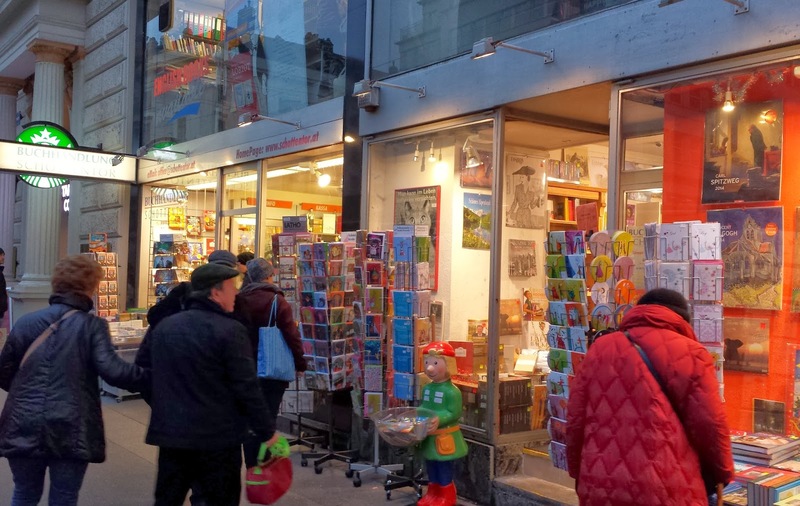 The first is the Dorotheum, a famous auction house; the second is a store that has hundreds of thousands of postcards for sale; and the third is a store that sells copies of old newspapers and other paper collectibles. 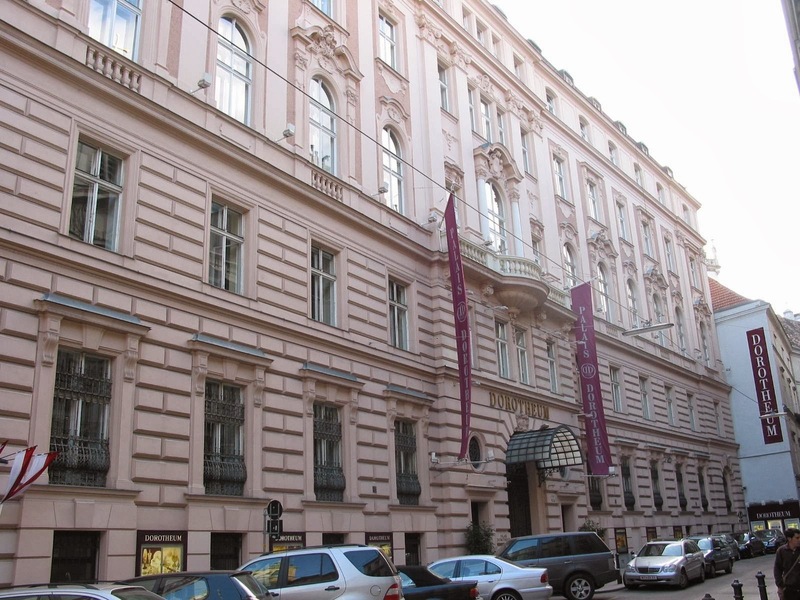 The Dorotheum is Vienna’s historic auction house whose origin dates back to 1707. It is the largest auction house in Central Europe, holding more than 600 high-end auctions each year. 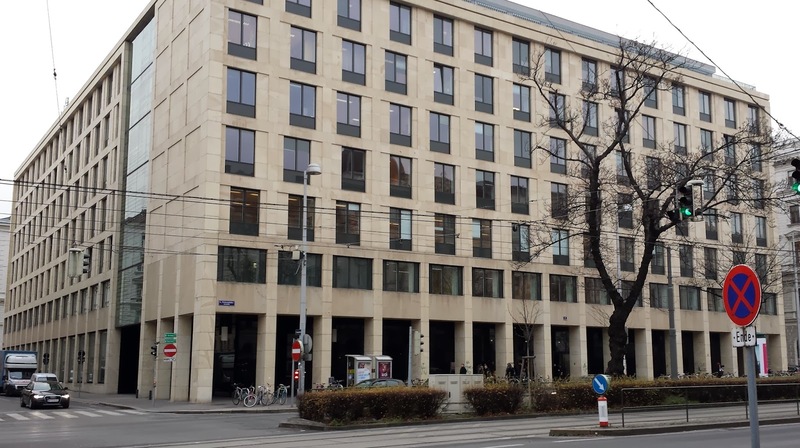 The auction house is located in at the large Dorotheum Palace located at Dorotheergasse 17 in the 1st district (not far from the Albertina Museum). The Dorotheum is open to the public and is worth a visit even if you do not want to attend an auction. Among its many auctions are four or so per year at which rare books are sold. (To see the Dorotheum’s schedule of auctions, go to this link: http://www.dorotheum.com/en.html ; an auction of books and decorative prints is scheduled for September 21, 2016.) If you are in Vienna when one of the book auctions is being held and you are willing to spend big bucks on books, you might want to attend. You can determine the items that will be sold at the auction through the Dorotheum website, or you can purchase a catalog listing books to be auctioned. The auctions are open to anyone, and they are easy to follow. The bidding procedure is simple, as with most auctions. If you make the high bid for an item, you pay for it immediately. When I was visiting an auction, it appeared that the people working at the auction spoke fluent English and are helpful. Likely before plunging into your first auction, you might want to talk to a person at the front desks on the main floor to make sure that you understand the rules. They all speak English. If you want to find an old postcard with a picture of specific location in Vienna or Austria, you may be able to find it at Kartomanie, Alte Ansichtskarte, located on a street runs along the side of the National Parliament building. The store’s address is Stadiongasse 4. I located this place when I was trying to find a postcard with a picture of Café Louve, which was located on the corner of Wipplingerstrasse and Renngasse. Through its search system, I was able to find a late 1890’s postcard with the Café in the foreground of a picture of another building that was constructed in the middle 1890s. Be advised, rare postcards are expensive. The web site for this store is located here: http://www.ansichtskarten­kartomanie.at/ . Contact the store through this website to find out when it is open. Hours seem to vary. 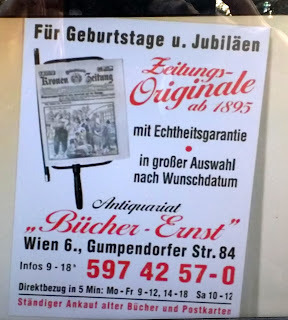 Another place selling old post cards and also copies of old newspapers is Bücher­ Ernst Buch­ und Zeitungsantquariat. Its main store is located at Gumperdorferstrasse 84. According to its website, the store has over a million copies of newspapers, dating to 1895, in its inventory. In addition to these stores, about two dozen Antiquarian stores – stores selling rare and valuable used books -- are open throughout the city. They have joined together in an Association of Austrian Antiquarians (Verband der Antiquare Österreichs) to work together to more their interests. 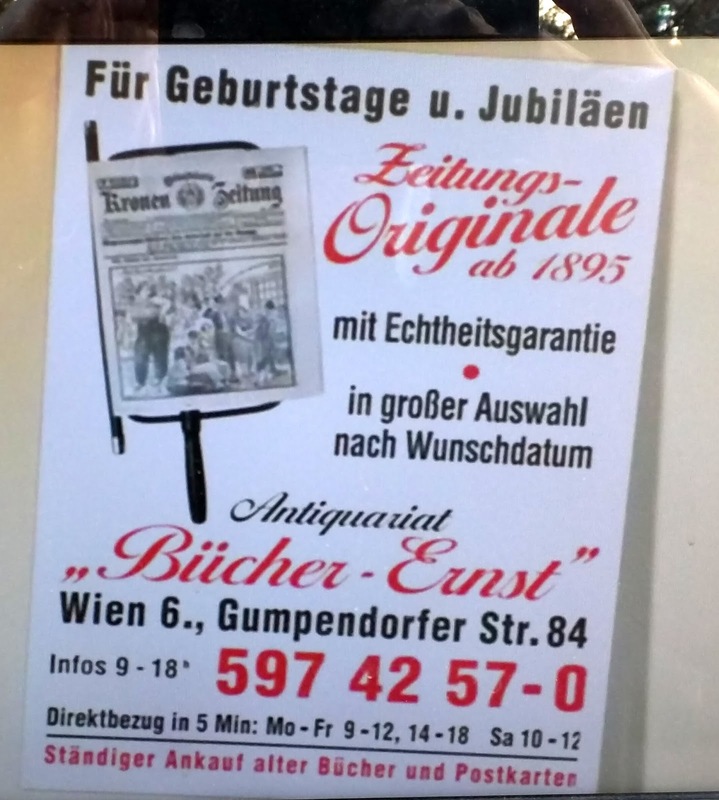 This Association has its own website (http://www.antiquare.at/ ) that provides information about the different sellers, antiquarian-related events in Vienna and Europe, and a database of books the different bookstore have for sale. I encountered the Verband der Antiquare Österreichs at the Vienna International Book Fair (Buch Wien 15) held November 12 to 15, 2015. Several of its members were displaying books for sale at a large both the Association had set up. The sellers had put together a catalogue that featured the books each were selling at the fair. Looking through the displayed books (most of which were way beyond my budget), I found one small book (177 pages) of particular interest. It was titled Schutzbundkämpfer erzählen von Februar 1934 (Schutzbund Fighters Tell About February, 1934). The Schutzbund was the militia of the Social Democrats. In February 1934, it resisted the successful action of fascist forces, led by the Heimwehr and supported by the Christian Socialist government, to seize dictatorial power. Following a short, intense civil war, prominent members of the Schutzbund fled from Vienna. Some went to the Soviet Union, where this book was published. Although I really wanted this book, I could not bring myself to pay the price of 450 Euros. Open hours: Monday – Thursday, 5 to 7 p.m.
Open hours: Monday – Friday, 10 a.m. – 1 p.m. and 2 to 6 p.m.
Open hours: Not specified. See website. Open hours: Monday – Friday, 10 a.m. to 6 p.m.
Open hours: Monday – Friday, 9 a.m. to 12 and 3 to 6 p.m.
Open hours: Monday – Friday, 9:30 a.m. to 6 p.m., Saturday 10 a.m. to 5 p.m.
Open hours: Monday – Friday, 10 a.m. to 6 p.m., Saturday 11 a.m. to 2 p.m.
Open hours: Monday – Friday, 10 a.m. to 1 p.m. and 2 to 6 p.m., Saturday, 11 a.m. to 2 p.m.
Open hours: Monday – Friday, 8:30 a.m. to 6 p.m., Saturday, 9 am to 12 noon. Open hours: Monday – Friday, 10 a.m. to 1 p.m. and 2 p.m. to 6 p.m., Saturday 10 a.m. to 1 p.m.
Open hours: Monday – Friday, 9:30 a.m. to 1 p.m. and 2 to 6 p.m.
Open hours: Monday, Wednesday and Friday, 12:30 to 6 p.m. Saturday, Noon to 5 p.m.
Specialties: Old maps and guides, Austrian and International Landeskunde, decorative graphics, art books and art catalogues. Open hours: Not specified; see website. I have not visited many of these Antiquarian bookstore, so I will not comment on them. You might want to scout which stores you would like to visit by checking out their websites. Vienna is rich with opportunities to find and buy all kinds of books. I hope this guide will be a good starting point for the exploration of the city's book stores when you are next time in the city. In the meanwhile, you might want to keep up with Austria’s book world by visiting some of the websites provided in this blog. 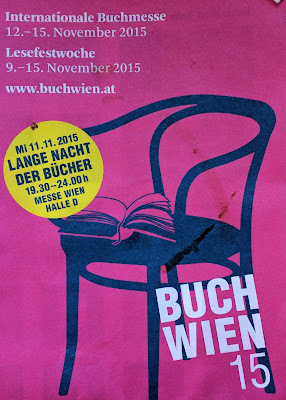 If you are going to be in Vienna in November 2016, you might want to dive into a lake of books and, if you speak some German, hear several authors speak at the 2016 Wiener International Buchmesse (Book Fair) and Lesefestwoche (Reading Festival Week). I attended the 2015 book fair and had great fun perusing the many publisher’s booths and listening to some authors speak. Thanks a lot for your hard work. I was able to plan an enjoyable morning out along this street while my wife bought shoes (seriously! Women!). Got two new, but cheap, books on Wollzeile, delighted with them. Now to learn German. Thanks, agus slán. I am glad to hear that the blog entry was useful and that you found some good books. I enjoyed doing the research on the book stores and wish, very much, that I were back in Vienna now checking out the new books and enjoying the other delights of Spring in the city. Do you have any experience buying books in the Baden-Wurtemmberg and Black Forest area in Southwest Germany? I will be going there later this year and would like bookseller and flea market information. Sorry, I have only passed through those areas and have not shopped for books there. Thanks. I enjoy roaming around checking out bookstores when I visit the city. I need to spend some more time checking out the antiquariat stores. I hope you enjoy life in Vienna; I sure enjoy spending a few weeks there every year. Thanks for such a remarkable resource! However it is such a daunting list to cover, even for someone who lives here. I am visiting Vienna only for 3 days. May i ask you to give your top five recommendations, my niche is science, technology and engineering related books - both easy to read and deep ones. I usually like anyiquariats where i could pick a handful of books for low prices. What would be your recommendations ? Sorry for the delay in responding. I would suggest, if you are going to be Vienna on a Saturday, that you go to the Flea Market on Naschmarkt. The number of books for sale there seems to increase each time I am in Vienna. I have gotten some great bargains there, though the selection is, at best, eclectic. You might just find some science/tech/engineering treasures. Also, Second Hand on Berggasse, near the Freud House, is worth an visit for exploration. No guarantees, but if you find something it will be a bargain.Not too far away, close to the main University building is Buebo Bookstore in the Neues Institute Gebaeue (to the left of the entrance), with a smaller selection, but again, with the potential for cheap treasures. 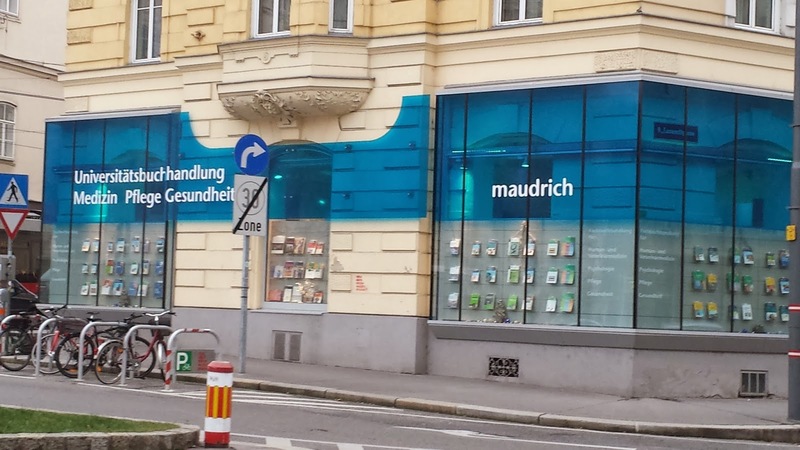 For new books, go to Manz Fachbuchhandlung. Even if you don't find anything, it is a memorable building. Also, check out two of the larger chains that will have the latest books in your fields. I especially enjoy Kuppitsch at Schottengasse 4 (mainly for history books, though it covers all fields). Morawa Buchhandlung seems to have the best selection overall of new books. If you are in Vienna on a Sunday, a good option is one of the Thalia Bookstores in Westbahnhof or Hauptbahnhof. Others are closed. Have fun!